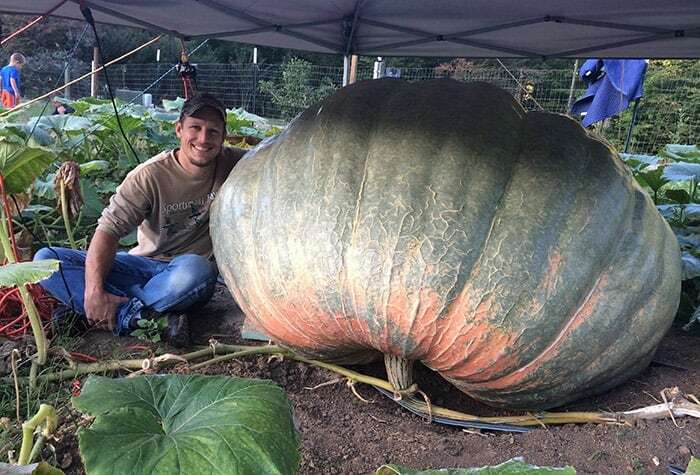 Elijah Meck’s gigantic pumpkin wins North Carolina State Fair competition. North Carolina’s largest pumpkin on record has had a busy schedule since winning first place at the 2017 state fair in October. It has visited a local high school genetics class, dropped by the Syngenta corporate location in Greensboro and acted as a giant jack-o-lantern in its owner’s front yard. The man behind the pumpkin is Elijah Meck, technical product lead for insecticides at Syngenta. He recently won the size-based competition with a pumpkin that weighed 1,458.5 pounds, more than 50 pounds heavier than the previous state record. Meck grew the prize-winning cucurbit in his Randleman, North Carolina, home garden. Meck and his wife, Michelle, have two sons: Wyatt, 8, and Owen, 5. When Meck travels for work, Michelle takes over caring for the pumpkins. “I depend on her to make sure the pumpkins keep growing healthy when I’m gone,” he says. Meck also grows giant watermelons and other basic garden vegetables, including tomatoes and sweet corn, in his garden. His largest watermelon to date weighed 170 pounds, which he says is not very large when juxtaposed next to his pumpkins. Each day, Meck spends time watering, weeding, fertilizing nodes, pruning vines and burying vines in his 1,800-square-foot garden. He says doing a little bit every day helps balance things out so he doesn’t get too far behind. Meck and other large pumpkin growers use a table of measurements, taking into account the length from blossom end to stem end as well as side-to-side (across the shoulders) and circumference measurements to estimate the weight of their pumpkins. This allows growers to have an idea of how much the pumpkin will weigh before the pumpkin ever touches a scale. Meck’s sons help him hold the tape measure around the pumpkin, so he can record a weekly measurement. Over the years, Meck has discovered that the seed is the biggest influencer in determining how large a pumpkin will grow. “It’s mostly about the seed and the variety,” he says. Meck chose a specific pedigree within the Dill’s Atlantic Giant variety in 2017; and with continual advancements in breeding, he anticipates that he and other growers will have the tools to grow larger and larger pumpkins each year. But, as with any crop, the seed alone cannot guarantee success. Soil and weather also play a large role in a pumpkin’s ability to flourish. “I always do a soil test to understand the nutrient level, the pH, organic matter and other factors, then amend the soil accordingly,” says Meck. In the South, sun and heat can increase disease and insect pressure, so Meck placed a shade cloth over most of his garden in 2017 to help reduce the sun’s intensity. But, he admits, the weather is something growers can’t control. Treating employees with respect, being socially responsible and having loyal employees are among the strengths cited..